If you would like some help with your device - smart phone, tablet, or laptop - then our Tech Help sessions might be right for you. Each session gives you 45-minutes of one-on-one time with our volunteer tutors. Suitable for all devices, Android, Apple, Windows or Mac. Bookings can be made online or in the library. Classes are free, we simply ask for a gold coin donation if you are willing. Appointments for January, February, March and April are now open on Monday afternoons, Wednesday afternoons and Thursday mornings at Unley Civic Library, as well as Thursday afternoons at Goodwood Library. We hope to continue these additional appointment times throughout 2016, but times are subject to change, so please keep an eye on our website or chat to our friendly staff for more details. New Reboot class schedule available now! Our incredibly popular, Getting to Know Your Tabletand Getting to Know Your Smart Phone classes are scheduled again for this year. If you would like to bring along your device and learn in a relaxed, small group (3 people maximum per class) environment then these classes may be right for you. Beginners and all levels are welcome - just bring along your questions and be ready to learn! Suitable for Apple or Android devices. Please see our brochure or check out our website for dates and times. 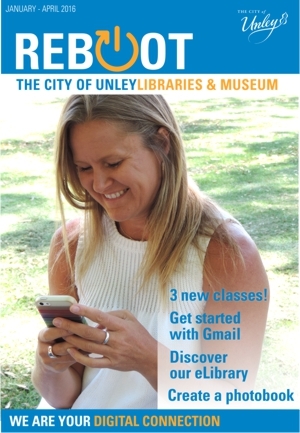 All classes are $20 and can be booked and paid at Unley Libraries. Did you know we have free ebooks and audiobooks in our libraries? We can teach you how to use Overdrive (ebooks and audiobooks) and Zinio (magazines) in these free small group classes. If you have your own mobile device you are welcome to bring this along, or library tablets and computer are available. Please note: you will need a basic understanding of how to navigate and use a mobile device or computer for these courses. If you need a little more help for this part, please book in for a Tech Help class, or enrol in one of our smart phone or tablet classes beforehand. Our friendly staff are available to chat to you about the best options. We also have some other brand new offerings for 2016, including Getting Started with Gmail and Creating Photo Books. Please see our brochure or website for all the details on these upcoming courses.